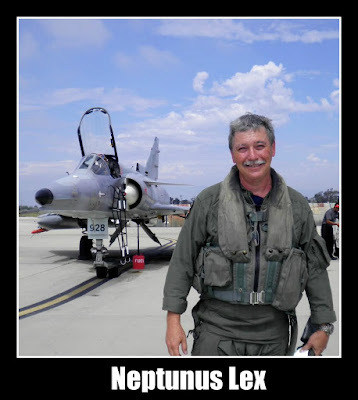 Neptunus Lex - as he was known in the Navy milblog community Captain Carroll LeFon, USN (Ret.) to the rest of the world - is gear-up, flaps-up and well on the way for his final mission. You can hear why by following this link. Back in the early days of the milblog world, there were very few. Lex was out there early in late '03, and when I started in mid-'04, I was already familiar with his work as one of the few Navy voices out there. With Sean, Joel, Chap, Will, Skippy, EagleOne - it was a small group in the beginning and we all helped each other out getting started, and Lex was there for all of us. Lex: "Not to tell you how to run your blog, but I think you went to far on that post yesterday." Me: "Am I on report?" Lex: "No, just thought I would give you a little nudge on your last post, as it is a bit too much." Me: "I know. You're right." Lex: "It's OK, its your blog. You just might want to let it sit for awhile before you take it out of draft next time." After our initial email conversation, I teased him a bit as the "Navy milblog SOPA." As at that time we were mostly to fully anon in many ways; we didn't really know who was the senior active duty blogg'r - but we generally gave Lex the nod. A gentleman, officer, good stick, good writer, and just plain good man. Over the years, we would comment on each others blog now and then - and exchange emails much more to share ideas, pass off tips .... or now and then return to our original conversation. That was Lex; part blog buddie, part mentor, part philosopher, but a gentle professional always. There were also a few projects we worked on together over the years in that way you can in the blogosphere. Always a pleasure to coordinate with as he was always focused on the goal of the collaboration - not himself. Thanks to the opportunities provided by USNI, I even had the opportunity to break bread with him a few times. He retired right before I did, and as I made that transition I watched Lex's path. The path that took him back to the aircraft. In a fashion, he died serving his nation as he knew best - in the cockpit. In life, on-line and off, he built a strong network of acquaintances and friends - that too speaks a lot for the man - and most of us are in the same place right now. On that note, I will leave Lex with a thank you, well done, and farewell for now. When we meet again. - Whisper stepping in to the breach at Lex's site. - Chap @ USNIBlog, along with many others. - Doc in the Box. kindlу dгop mе a maіl? What's up, always i used to check webpage posts here early in the daylight, as i love to gain knowledge of more and more. channel sales wen of 13.6%, the wholesale means sales multiply of 9.9%. Where is a decent pub here? Hot Mic Mr. President .... HOT MIC! How About, "He's an Evil SOB." Do you Need "Character and Integrity?"